Just listening to the list of Joe Pasquale's feats and achievements is enough to tire most people out. The former I'm A Celebrity… Get Me Out Of Here winner, who more recently starred in ITV's Dancing on Ice in 2013, has barely stopped to catch breath as he lives up to his reputation as one of the hardest working UK comedians around. But hopefully he will have enough strength left to bring a smile to his fans in the Midlands as he prepares to perform at the Lichfield Garrick theatre on Sunday 9 August. Joe returns to stand-up comedy after two years, fresh from a theatre tour and West End run as King Arthur in Monty Python's Spamalot. He said on the eve of his new comedy tour: "I've never really gone away from stand-up - I was just doing other stuff. Stand-up gives you such a buzz. It's like riding a rollercoaster or going to a really good scary movie. I enjoy that sense of fear and that feeling of flying by the seat of my pants. "The great thing about stand-up is that it's different every night. You never know what will happen at any given show - and that's what I love about it. That's why I took up flying, parachute jumping, boxing and running. That fear is what stand-up is all about. You go out there without a net. Nothing is guaranteed." Joe promises more of the mayhem and "nonsense" which has made him such a consistently popular comedian for a number of years, with predicted appearances of a Lovejoy-style mullet wig and his 'stage manager' Raynard re-enacting the "You're So Money Supermarket" ad. Joe, who is currently studying for a BSC in Geo Science through the Open University, looks back fondly at his success in winning I'm a Celebrity … Get Me Out of Here in 2004. "It was a turning point for me. People whinge about it and ask 'why did you do that? ', but I really enjoyed it. I think people respond to you in the jungle because it's not the sort of place where you can pretend to be something you're not. You can't hide for three weeks because you're starving!" Joe, who got his big break on television's New Faces talent show in 1987, had previously held down various jobs ranging from a porter at Smithfield meat market to the civil service and spot-welding Ford Cortinas. The next role for this non-stop comic after his stand-up tour is panto, when he'll be playing Wishy-Washy in Aladdin in Southampton. "I love panto because I'm given carte blanche to throw the script out of the window and do my own thing." So does he think he'll ever retire? "No. You don't pack this business up – it packs you up. I just really enjoy it. You can't take it too seriously. People die,and then you realise what's really important in life. What I do is not important. You have to remember that. "It's not like being a brain surgeon.You're not under pressure in my job. All I have to do is turn up and make people laugh. Pressure is when you're a brain surgeon in the middle of an operation and you're desperate to sneeze. I mess around for an hour, but no one's going to die from it. Whereas if a surgeon sneezes into your brain, that could be fatal." 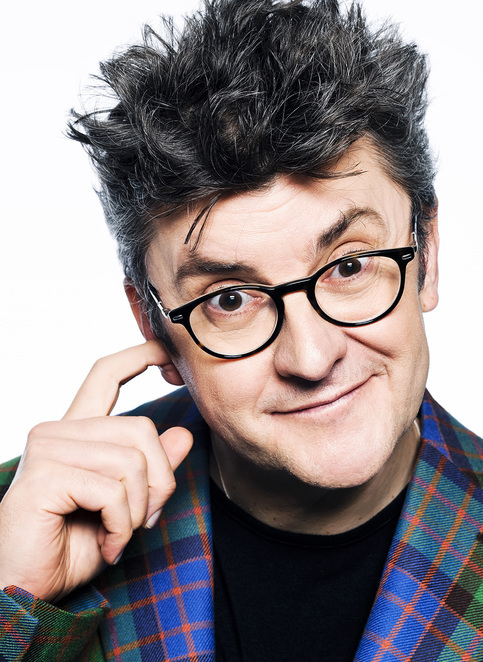 See Joe Pasquale on tour at the Lichfield Garrick on Sunday 9 August at 7.30pm. Tickets cost £20 and can be booked online at www.lichfieldgarrick.com or by calling Lichfield Garrick's Box Office on 01543 412121.